One of the most important aspects of any player’s game is their stroke. Without a solid stroke, it’s almost impossible to improve. You can practice all you want, but even if you “hit a million balls”, as Efren Reyes would say, with a wonky stroke you probably won’t get any better. The best way to hone in your stroke fundamentals is by working on developing a perfect pendulum stroke. In golf, there’s a term called the “sweet spot.” The sweet spot may vary from club to club, but once you find it, you’ll know it. All it takes to miss the sweet spot is the slightest torque or twist of the club. With a poor swing, the intended energy does not get fully transferred to the ball. The same principles can be applied to your pool stroke. When it comes to your stroke, timing is everything. Think of your hanging forearm as a pendulum. A pendulum is a weighted, mounted object that uses gravity to swing back and forth freely, like the arm on a grandfather clock. Now, cradle the cue stick lightly in your hand, using the weight of the cue to swing your forearm freely back and forth. If you find yourself gripping too tightly to the cue, it will be very difficult for it to swing freely. If you catch yourself dropping your elbow with each stroke, you may be adding unwanted twist or rotation to your stroke. 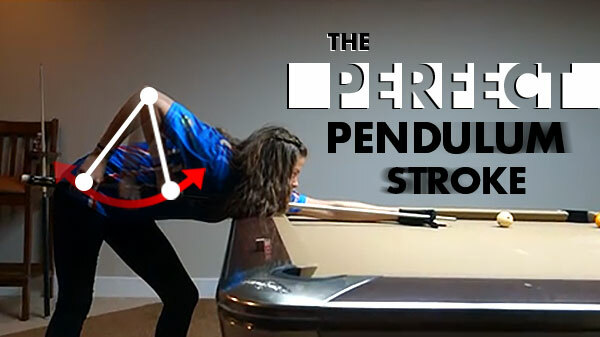 Check out Junior State Champion, Amanda Campbell's perfect pendulum stroke! Think of your elbow as a hinge. A hinge allows two parts to move back and forth on a line with limited rotation. Your shoulder, on the other hand, is a rotary joint. When a rotary joint is involved in the pool stroke it can mean problems for your follow through. When you drop your elbow, you activate your shoulder's rotary joint which can cause miscues from unpredictable rotations. Frank Says: "Need a little extra help working on your pendulum? Look no further than the Stroke Groover. It's simple to use and it can really help your fundamentals!" To achieve more acceleration, you may see the professionals incorporate an elbow drop in their follow through but they have put thousands of hours into perfecting their stroke. As you’re developing your perfect pendulum, work on consciously keeping your elbow up and hinging only from the elbow. The next step to a perfect pendulum stroke is making sure you make good contact. Make sure you get your cue tip closer to the cue ball with each warm up stroke. At the point of contact, your forearm should be perpendicular with your level cue stick. Think of this at the bottom of the swinging pendulum. This is how you’ll find the “sweet spot” in your pool stroke. 1) Get your cue tip as close to the cue ball as possible in your warm up strokes. 2) Make sure your forearm is perpendicular at the point of contact. 3) Work on hinging only at the elbow, without getting your shoulder involved.